My Mum likes to say that you can always squeeze in one more fruit tree, and she has a point – especially if you’re at the planning stage. It is possible to fit a huge variety of fruiting plants into a small garden if you are not constrained by traditional images of sprawling orchard trees with children climbing sky-high or swinging from their branches on long rope swings. Much of the advice we read on growing fruit trees has come from northern hemisphere climates where competition for sunlight is more of an issue than it is in Australia, or has been based on commercial orchards which traditionally relied on larger trees spaced further apart than is viable in small home gardens. 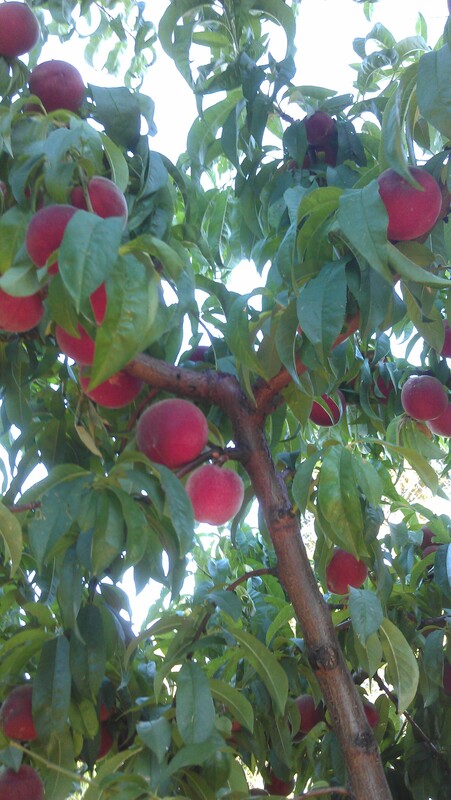 White peach – a full-sized tree that is pruned annually after harvest to stay below 3m tall. What is the mature size of the plant? Does it grow vigorously or slowly? If it is a grafted tree or vine, this will largely depend on the rootstock and your nursery should be able to advise on a suitable rootstock for your location, soil type and desired style of growing. How will you train the plant to the desired shape and size? Options include the traditional open vase or central leader shapes for deciduous fruit trees, espaliering (growing on wires, trellis or flat against a fence), cordons (trees trained to grow strictly up an inclined wire or pole to minimise their footprint) or growing over a pergola, not to mention container growing – particularly suitable for small citrus trees and figs, which can bear prolifically without needing a large root run. When will you prune? Traditionally deciduous trees have been pruned when bare in winter, but if you wish to keep the fruiting wood within easy reach (and easy to net against birds and other fauna), then pruning immediately after the fruit is harvested will be more effective. Do you really need to be self-sufficient in your own garden? Often the most efficient way to produce a varied harvest is to plan and share with extended family or local community – e.g. you grow peaches and your neighbour grows nectarines so you can swap – this is particularly helpful when a huge crop needs to be picked and eaten or preserved quickly in hot weather. The same principle applies to choosing varieties with different ripening times – planning this among a group of households helps to keep the harvest manageable. The greater the cooperation between families, the fewer trees need to be accommodated in any individual garden. Dwarf citrus trees, e.g. Tahitian lime, Eureka or Lisbon lemons, Imperial or Emperor mandarins and Washington Navel oranges – all available on dwarfing rootstock. Meyer lemons and cumquats tend to be naturally small trees and are well suited to container growing. Dwarf deciduous trees – stone and pome fruits – an increasing range is becoming available as either ‘dwarf’ or ‘super dwarf’ varieties. These include peaches, nectarines, peacharines, cherries, apples and pears. Most have been bred to be self-fertile (i.e. no pollinator required) so they represent very good value for the space available. The fruits are full-sized but the tree will require far less maintenance pruning than its more vigorous forebears. Vines – fruits such as grape, kiwi, passionfruit, brambles (raspberries, youngberries, boysenberries etc) and cape gooseberries can be grown on a fence, trellis or pergola, where they can serve multiple functions of providing summer shade, beauty and food. Grapes and kiwi are particularly well suited to a pergola so that they have adequate light and ventilation, while berries cope well with dappled light on a fence or trellis below. Then there are the ‘fruits’ that we can grow more like perennial or annual vegetables – strawberries, rhubarb and melons – strawberries can be stacked in pots or vertical garden planters to save space, rhubarb can decoratively fill an awkward corner as it doesn’t need frequent access, and melons are great for seasonal growing in those garden patches to the south of a building that only receive sunshine in the summer months. Multi-grafts are trees that have several varieties of related fruit grafted onto a single trunk (e.g. peach/nectarine/peacharine, multiple types of plum, multiple citrus). They do require strict maintenance to ensure that the more vigorous variety doesn’t take over from the others. An alternative approach is to plant two related trees in a single hole and let them merge to grow like a single tree. This approach can be useful where two varieties are required for cross-pollination, e.g. with some apples or plums. Plant out the road verge or nature strip, especially with unusual fruits that might be new to your community. It’s surprising how reticent people often are to take fruit grown on public land – I even had to put a sign next to our apricot tree on the verge to invite people to pick the fruit before the birds got it. Invite local institutions to host fruit trees on their grounds and share the harvest in return for some help with their maintenance – e.g. kindergartens, child care centres, schools, scouting groups, RSLs, aged care facilities. This can also provide opportunities for schools and kindergartens to experiment with aspects of gardening in their curriculum. Landsharing is when gardeners have permission to grow food on someone else’s property, either free or for a small rental fee or in return for other services. An example would be where a young family living on a small block grows fruit or vegetables in a larger backyard owned by elderly neighbours. It’s a win-win because the land is maintained, the harvest can be shared, and inter-generational friendships can also be nurtured. Finally, don’t be afraid to take drastic action. If a big old fruit tree is no longer productive, it may be time for rejuvenation pruning (off with its head!) or replacement with several smaller-growing trees. The short-term sacrifice could pay off with decades of high-quality fruit to follow. This entry was posted in citrus, fruit, permaculture design, planning. Bookmark the permalink.